Electricity and gas can be dangerous or lethal! if misused or not installed correctly, water can flood and cause damage. There are legal requirements for landlords to ensure all electrics and gas are maintained properly and in a safe working order and provide certification proving that all is safe. Why are the recent clip on electricity monitors not very accurate? 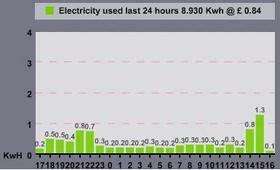 I have two and the readings they produce are quite different, and also don't match my electricity meter. If you read the small print the accuracy is quoted sometimes as "Accuracy <1A: Not specified. Accuracy 1A to 3A: Better than 10%. Accuracy 3A to 71A: Better than 5%" that's an awful lot!! If you are into maths, electricity is measured in watts, watts = amps * volts. The thing you clamp round the meter live wire measures amps (by the magnetic field) fairly accurately but as it isn't connected to the live and neutral wire ( for safety) it doesn't know the volts. It relies on either the default 230 or what you enter in the settings. With European harmonisation standards the UK voltage should now be 230 V -6% / +10% , AC, 50 Hz, (216.2V to 253V) but in practice, nothing has been done to change it from the Previous 240 V +/- 6% (225.6V to 254.4V) as it's roughly the same! As the volts swing up and down a bit, the sum amps*volts accuracy differs by the fixed volts you entered to the actual voltage. Although these units are good as an indication, the novelty soon wears off and it's cast to the back of the string and old keys draw in the kitchen when the two sets of batteries need replacing. It's much better to use something like Homemon's connected home, enabling accurate electricity, gas and water readings from anywhere using your PC, mobile phone,iPad or iPhone (or IPTV screen) to allow evaluation of energy saving methods. 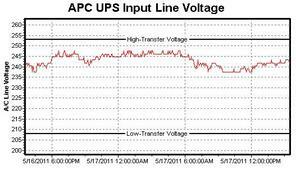 Mains voltage wandering up and down from 237 to 248 Volts, shown on a 24 hour graph from our APC UPS. This demonstrates if you don't know the voltage it affects the accuracy. Whilst checking the meter, it occurred to me I wonder how accurate the meter is? Although approved when made it may be 10 years ago? If it's overeading it could be costing you money. It is a worrying fact that with the many millions of meters out there, they don't seem to be regularly checked. I'm checking my meter this week and devising an easy check anyone can do, the results may be interesting Basically you need to turn everything off, and have a known fixed load of say 1Kw the meter should not turn (or if LED flash) when every thing is off, run the load for an hour the meter should turn of flash in my case 200 times and display 1 extra kilowatt The gas could be tested in the same way perhaps with a known gas hob burner? watch this space!! I have changed my dishwasher from cold fill to hot fill. The dishwasher uses quite a bit of electricity heating the cold water to 65°C, so filling it with 45°C from my efficient water heater should save money. Here are the before and after electrical usage graphs, you can see the narrower twin peaks on the lower graph showing the saving. Cold fill uses 1.6Kw, hot fill uses 1Kw saving 600 watts of electricity per wash.